At the opening were John McArdle Ipswitch, Austin O’Malley, Rich Welch, Ipswitch, Michael Hack Ipswitch, and Catherina Blewitt, IDA. 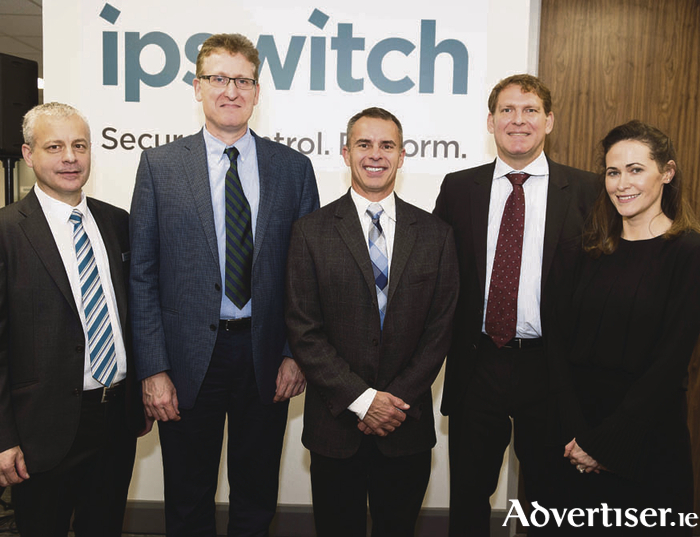 IT and network management software company Ipswitch has opened a permanent EMEA (Europe, Middle East and Africa ) centre of excellence at Citypoint, Prospect Hill. The permanent office locations signifies a substantial investment for the company and supports its EMEA growth strategy. Twelve research and development, sales and technical support team members will initially move in with a plan to increase headcount up to 60 in line with the positions announced last March. The expanded EMEA core team, based in Galway, will provide local language and local time zone technical and sales support to their in-country partners and customers across Europe. They will also provide central support for the company’s in-country teams across Germany, UK, France, Italy and the Middle East. The centre will host a dedicated partner and customer demonstration suite for sales, which will facilitate events and training. Ipswitch plans to hire skilled employees from within the local community to facilitate its growth. The company is partnering closely with both the National University of Ireland Galway and Galway Mayo Institute of Technology Business and Computer Science faculties for graduate opportunities. Michael Hack, SVP of EMEA Operations commended: “In October 2015 we set an aggressive target to double our EMEA business by 2018. We’re on track and seeing double digit growth. Then in March 2016, when we first set up a support by the end of 2016. Under John McArdle’s leadership, Ipswitch EMEA Channel Director, we’re already well ahead of plan with 12 employees within several functions including R&D, technical support, sales and technical writing roles. We have a further two additional positions approved to hire this year, which will bring the office to 14 employees or 55 per cent higher that our original plan. This fast track growth now means that Ipswitch needs a permanent office space that we can expand into. We plan to create the announced 60 jobs that will be based in the new Galway office over the next five years. The development is supported by the Department of Jobs, Enterprise & Innovation through IDA Ireland. The privately owned company which has its headquarters in Lexington, Massachusetts, employs over 300 people in the US, Europe, Asia and Latin America. Ipswitch software has been installed on more than 150,000 networks in 168 countries, with customers including Hamleys, NHS Wales, Cambridgeshire County Council and Community Integrated Care. Ipswitch already has research and development centres in Germany, Atlanta and Augusta, Georgia, and Madison, Wisconsin. Ipswitch IT and network management software provides secure control over business transactions, applications and infrastructure. The vendor’s unified infrastructure and applications monitoring software provides end-to-end insight, is staggeringly flexible and simple to deploy. Its information security and management file transfers for millions of users.